Trey Bennett traveled with FFA to Range Judging on Monday the 26th. For the Range Judging ,Trey looked at plants and identified them as well as seeing how many head of cattle could be on each range. Trey determined how many cattle should be in an individual range to prevent over and under-grazing. Overgrazing can ruin the land, and under-grazing can prevent farmers from making enough money. Trey’s favorite part was walking through the range and “getting to see all the nature." Range sites differ in size; one range site could be 1,000 acres compared to a site of 628 acres. The range judges then find the proper amount of cattle for each of the sites. Trey had a fun time, and would like to be a Range Specialist for the NRCS. NRCS stands for National Range Conservation Service. Trey is looking forward to participating in another Range Judging competition in the near future. As a group, all the Holyoke FFA members who attended received medals for judging, and the group qualified for state. 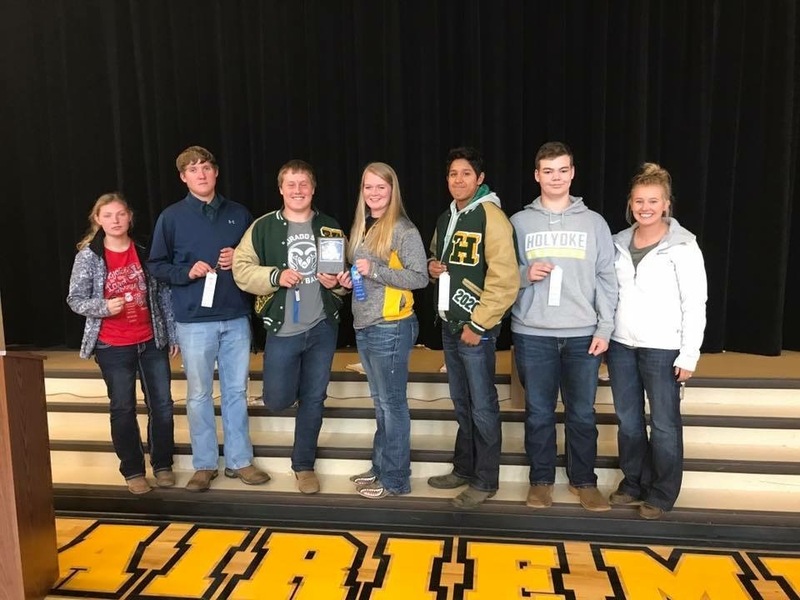 Luis Chafino, Cole LeBlanc, and Trey Bennett received bronze medals, Janessa Lutze received silver, and Kaitlyn Kent and Chase Beckner received gold medals.